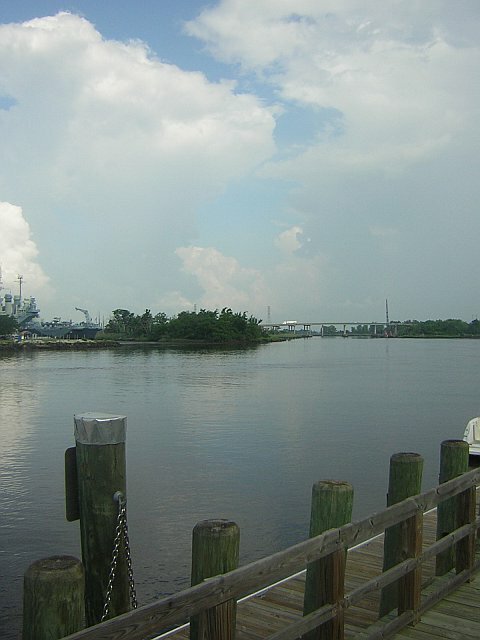 I arrived in Wilmington, North Carolina early on Day 265, having gotten very little sleep the night before. Thanks to not checking my luggage, I walked off the plane and directly to my rental car with several hours to kill before anyone else in my family was planning to arrive. So I decided to tour Wilmington as the Day 265's thing I've never done before. To be fair, I have been going to the beach near Wilmington since I was two-years old, so there is a good chance that I've toured the city before. But since I didn't remember, and my mom couldn't either, I'm counting it. I drove into the downtown, which was every bit as quaint as I imagined the southern coastal town would be. On the way, I saw lots of old homes with big porches and big oak trees with branches that shade the streets. I parked my rental car and walked through the streets, down by the water and the weekend farmer’s market, snapping pictures of things that looked old and therefore significant. 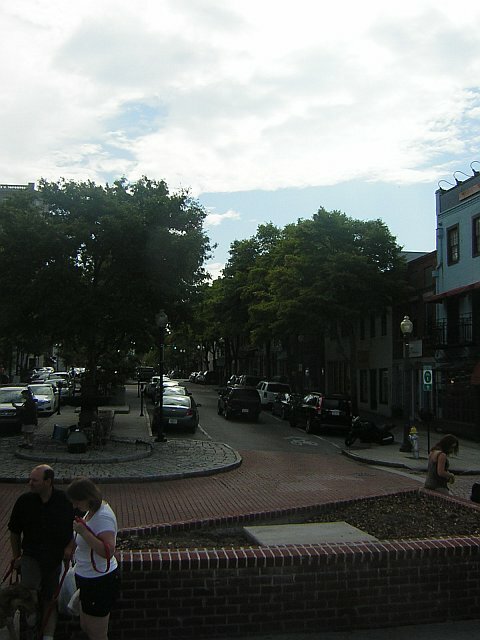 Despite its quaintness and laid back feel, Wilmington had a touch of Nashville added in since becoming, over the years, a popular site for television producers and filmmakers. 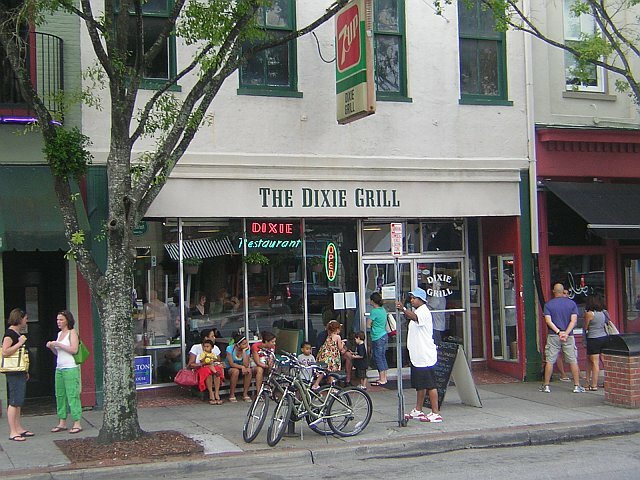 Shows like One Tree Hill and Dawson's Creek were filmed there. I kept looking around expecting to see someone famous walking down the street. And then I remembered that I don't watch shows on the WB, so even if they did I probably wouldn't recognize them anyway. 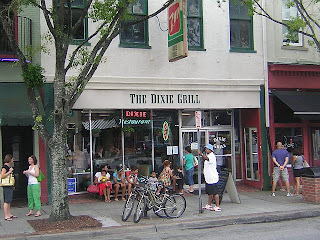 I wandered into a local diner, and popular breakfast spot, the Dixie Grill, sat at the bar and ordered a vegetable omelet and a coffee. My seat allowed me to split my time watching the World Cup and watching people coming and going. After eating, I did some more walking around town, window shopping at some of the upscale boutiques. I was fading fast, though, and decided to leave Wilmington to start making my way to Oak Island, which was about half an hour away. 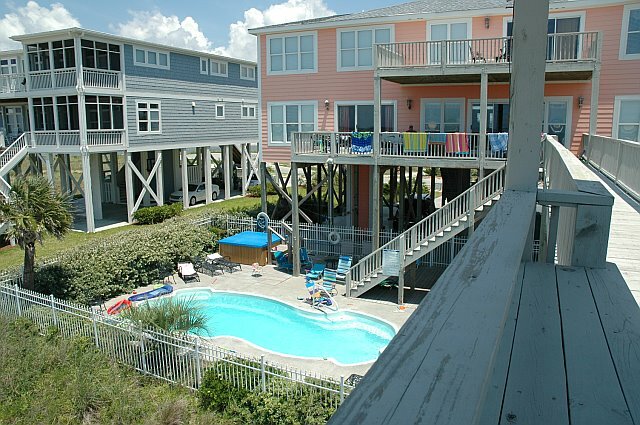 I pulled over in a bank parking lot and took a nap for a little while, but after receiving clearance and directions from my mom, thought maybe it'd be better if I napped by the pool at the house we'd rented. So I headed that way, and made Day 265's thing I've also never done before to change from regular clothes into a bathing suit in the front seat of a Dodge Neon. I was sitting on the steps of the pool when a woman who worked for the Realtor arrived to make sure the house had been cleaned properly. She seemed surprised to see me. I explained to her that I had arrived early, and that my family was on their way in a couple of hours with the key and that I was just going to sit by the pool and wait for them to get there. Still looking skeptical, she took out her cell phone and began making a call. I could only hear her side of the conversation. She repeated exactly what I had said to her. That my cousin Bethanne was bringing the key in a couple of hours and I was just going to hang out until she and the rest of my family arrived. I wasn't sure if she is a stickler for the rules, or didn't believe me when I told her that all I wanted to do was to take a nap by the pool. Maybe I just look like I'm up to no good. But after she hung up the phone she said, "We're going to have to ask that you vacate the premises until your family gets here. It's just a liability that we can't take on." "Vacate the premises?," I'm pretty sure in 29 years I'd never had anyone say that to me. And no one has ever accused me of being a liability right to my face. 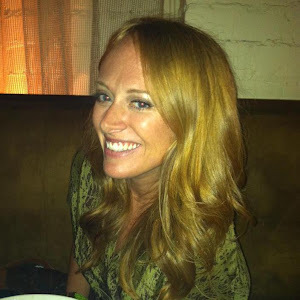 Apparently this woman, or her bosses back at the realty company, mistook me for 21-year old Stephanie. Couldn't they tell that I'm older now, almost 30, and responsible? I guess not. I was annoyed that I was forced to leave the pool, but somewhat relieved that despite the fact that I'm almost 30, I still look young, stupid, and capable of doing serious damage to property or physical injury to myself. So much so in fact, that without the renter of the house there with me I simply couldn't be trusted to nap, which is all I wanted to do. So since I couldn't stay at the pool, I decided I'd raise hell out on the beach. It was 11:30am, after all, and I'd slept at least two hours the night before. I didn't have a beach chair or a towel to lie on, so I took a walk on the beach and waited for my parents to arrive. They did, signaling that it was safe and appropriate for me to return to the premises. Shortly after, the rest of the extended Gallman family arrived. Not because of any one person, or any event, specifically. But because when 33 people who have been cooped up in cars all day arrive at the same place, at the same time, with a week's full of luggage, snacks, drinks, beach chairs, paper products, board games, and beach toys, to unload, chaos abounds. Oh, and 14 of those 33 were under the age of 18. I wished that the cleaning inspector woman had returned to see the insanity so I could look at her and say, "See, lady, who's the liability now?" I escaped briefly to buy beer for everyone, my contribution to the week's vacation, but for the next few hours, we unloaded cars, stocked pantry shelves that looked like they were meant for a shelter, and geared up for vacation, Gallman Family style.